This is an extraordinary time for female athletes, especially in the United States. Serena Williams — arguably the greatest American athlete of all time — won the Australian Open while pregnant. Simone Biles crushed international gymnastics at the 2016 Olympics. Mirai Nagasu just landed a triple axel at the Winter Games, and our women’s soccer team is expected to continue its dominance at the World Cup next summer. As an orthopaedic surgeon who cares for young female athletes (and as a woman and sports fan), it’s impossible for me not to be thrilled by these incredible achievements. American women and girls are participating in sports as never before. Since the passage of Title IX in the 1970s, the number of U.S. high-school girls playing sports has increased tenfold. Fifty years ago, women were told we couldn’t run marathons lest our uteruses fall out (seriously). That kind of ridiculous lore is now (I hope) unimaginable to young runners who compete at any distance they choose. Thanks to cultural progress, the profound benefits of sports participation — better health and habits, self-assuredness, teamwork — are available for young women to reap as well as for their male peers. Unfortunately, these advances haven’t come without risks. Female athletes are subject to different risks than their male counterparts, sometimes in the same sports. For example, the risk of injury to the ACL is considerably higher for females playing cut-and-pivot sports like soccer. These injuries can happen without contact and require surgical reconstruction and extensive rehab, resulting in a significant amount of time spent benched — in some cases, up to a year. Concussion is also more common in young women than in young men playing the same sport. And sports in which appearance or low body mass is important — gymnastics, running, dance — can subject young women to the “female athlete triad”; they don’t take in enough nutrition, which leads to limited energy, menstrual dysfunction and bone loss. It is, of course, impossible to discuss the particular risks faced by female athletes without mentioning sexual abuse. Larry Nassar’s horrific and brazen mistreatment of hundreds of young women is, sadly, only the most recent and most public of countless examples of athletes abused by coaches and others in positions of power over them. Protecting young female athletes involves teaching them about specific risks and, where possible, training to mitigate them. But raising these athletes’ awareness of the risks of particular injury and the potential for sexual abuse also raises an important question: How do we educate them without teaching them that they’re particularly weak or fragile? There isn’t an easy answer to this question. We can certainly point out that male athletes are also subject to some specific risks — such as greater odds of traumatic shoulder instability. We can also push toward bigger-picture change: I’d like to teach young women to revel in their strength, to be proud of their power and accomplishments not because #strongissexy, but because strong is worthwhile in and of itself. I’d also like us to push for young female athletes to reclaim some autonomy over their bodies. Silence and obedience aren’t the same as grit — an athlete should be encouraged to push back against “treatments” that are painful or humiliating or, frankly, abusive. The care of young athletes should include their empowerment, so that extraordinary athletic achievement doesn’t come at so great a cost. 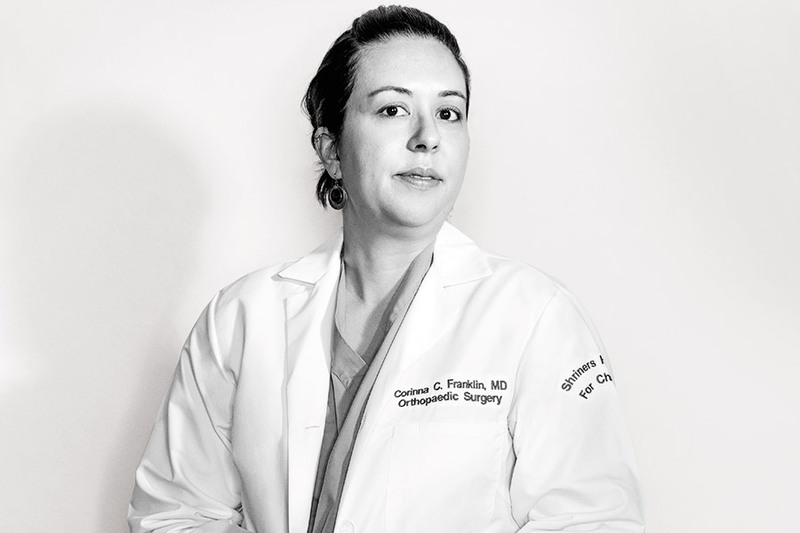 Corinna Franklin is a pediatric orthopaedic surgeon and director of the FIERCE program for female athletes at Shriners Hospital. Published as “The Stories They Tell … ” in the May 2018 issue of Philadelphia magazine.